Let us know what you think and what other examples you'd like to see in the future! 98 Views Comments: 0 Permalink Tags: workforce, jupyter notebook, python. Introducing the Workforce Python Module! Last week, Esri released an update to the ArcGIS API for Python (v1.4.1). Among the many updates, this release included a new API for managing projects within Workforce for ArcGIS! We’ve had sample scripts hosted on GitHub for several years which show how to use Python to accomplish many tasks such as programmatically loading assignments from external data sources, importing and managing workers, removing completed assignments, and more. However, several of those scripts require extensive knowledge of the Workforce project schema and rules. In an effort to simplify the automation of Workforce tasks, the ArcGIS API for Python now includes a specific module for managing Workforce projects. This is awesome new functionality that will greatly improve and simplify your Workforce automation workflows. We plan to update the workforce-scripts repo in the coming weeks to use this new module. In the meantime, please check out this this Jupyter notebook which highlights how to use the new Workforce module. Additional documentation about the workforce module can be found here. We are adding new features to the Workforce for ArcGIS website and wanted to let you know that we will be releasing an update in the next couple of weeks updated today (Feb 20th, 2018).! If you are using ArcGIS Online, this will be a seamless update to the workforce.arcgis.com website and your existing projects will continue to work as expected. If you are using ArcGIS Enterprise, this will be the official release supporting ArcGIS Enterprise 10.6 and when you sign in to the MyEsri website, you will find a new setup for Windows and Linux called "Workforce for ArcGIS 18.0.1" under Apps in the Downloads section. Later this week we will update MyEsri with the ArcGIS Enterprise 10.6 setup. 1. Instead of adding mobile workers one-by-one, you can Add Workers from a File. A template CSV file is provided for you to populate with new workers and you can pre-populate it with existing workers if you like. 2. Explorer for ArcGIS is available within the App Integration screen on the Advanced tab so your field workers can open Explorer at the location of a work assignment and redline on top of it. You can add Explorer integration either at the Project level or at the assignment type level. 3. In our last update, we added the ability for you to pass the ID and Location Description fields from the Assignment to the feature you create in Collector or Survey123. With this update, you can now pass the GlobalID field as well. Passing the GlobalID to a string or GUID field, you can establish a relationship between the feature collected/inspected and the assignment itself. 4. 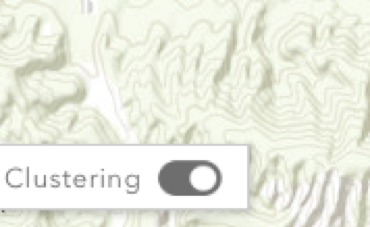 If you have enabled the use of Esri Vector basemaps in the Map settings of your Organization, we will use the Navigation basemap when creating a new project. In addition to these 4 updates, there are a number of stability enhancements. These updates will be coming soon are now live! Workforce for ArcGIS is updating! 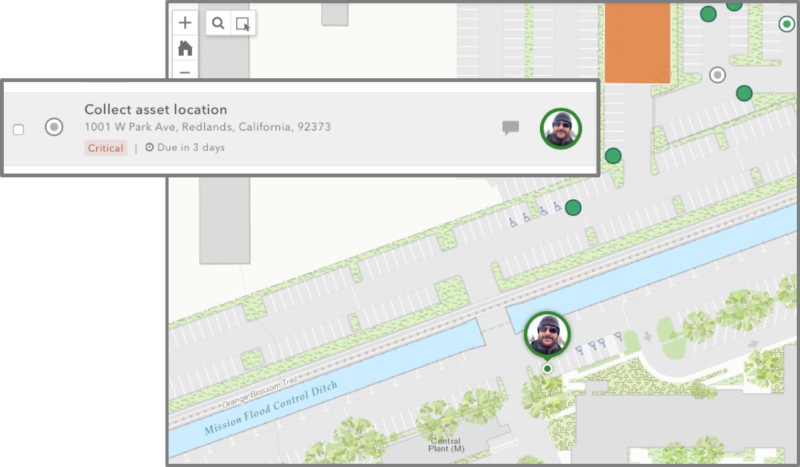 Workforce for ArcGIS is rolling out a new update, both to the Workforce web app that is used to create projects and dispatch work, as well as the mobile client apps on the iOS and Android platforms. 1. Project Owners can now deepen the integration between Workforce and Collector/Survey123 by passing the Workforce ID field and Workforce Location field to attributes they map on either their web map or Survey form. This provides a loose coupling between work assignments and the work accomplished. 2. Dispatchers have additional information about work assignments that improve their decision making process. For each assignment, the name of the dispatcher is displayed and the Date/Time of when assignments were created and when an assignment changed state is displayed. 3. Location is important when creating and assigning work and we don't want the panel to get in your way. Now you can hide/show the panel when you want to. In addition to these top 3 enhancements we have fixed several bugs in the Workforce web app. November 31st Update - The ArcGIS Enterprise 10.5.1 setup that includes the web app enhancements is now available on https://my.esri.com in the Apps section. Updates to the mobile apps for iOS and Android within their respective stores in December. Wall-mounted maps have "You are here" bubbles, and our phones use a dot on the map to show current location. But those are clearly not determined the same way: a wall-mounted map always has the same location, while your phone moves about with you. And how your location is determined varies between devices and even app to app on a single device. To best understand the location information presented for mobile workers in Workforce (both our own as a mobile worker, those of other mobile workers, and those of our mobile workers when a dispatcher) we need to understand how location is determined in Workforce. First, let's understand what the dispatcher is seeing. The location presented for each mobile worker is simply the location the mobile worker's device is passing to Workforce. Once we understand how the mobile device is handling the mobile worker's location, we'll also know how the location the dispatcher is seeing is determined. The only catch is that the location isn't updated for dispatchers continuously; instead, the mobile worker's device updates the mobile worker's current location every minute. This is the location displayed in the web app. When a mobile worker sees the location of another mobile worker in the same project, their view of that other mobile worker's location aligns with that the dispatcher sees. While they are receiving the same information from the project, it might not exactly match the dispatcher's view. In addition to the offset introduced by mobile workers updating their location with the Workforce project every minute, the mobile worker reading the location is also only checking for updated locations every minute, so the position seen can be up to 2 minutes old. The location reported on the mobile device depends on the information available to the device. If your device doesn't have GPS, it uses a combination of cellular and wireless signals to determine your location. If your device also doesn't have GPS or cellular service, wireless signals are used. GPS generally provides the most accurate locations, after that Wi-Fi, then cellular. A more accurate location means that its margin of error is less. Your position might be identical, but if you know you have 10 meter accuracy, you know you are likely within 10 meters of the location shown. If you have 30 meter accuracy, you know you are likely within 30 meters of the position shown. In Workforce, the blue circle around your position indicates the accuracy. In the image below, Workforce believes you are between the tree and the other mobile worker (green pin). However, you might be closer to the green dot, or you might be with the other mobile worker. But it is pretty sure you are inside the bigger blue circle. On Android, you can choose a mode for your location (High accuracy, Battery saving, Device only). This changes what is used to calculate location. High accuracy (the default) uses GPS, Wi-Fi, cellular, and other available sensors through Google's Location service to get the highest-accuracy location. Battery saving doesn't use GPS, using only Wi-Fi and cellular through Google's Location service, saving battery. Device only uses only GPS, turning off Google's Location service. Changing this value affects the location you see in the app. One last thing to understand about location services on iOS: they never provide an accuracy less than 5 meters. Even if you are using an external GPS with sub-meter accuracy, Workforce uses location services and while the position used could be more accurate, the accuracy reported will still be 5 meters, at best. You might notice this if you look at the historical tracks of where mobile workers have been. A mobile worker will see their position updated continuously. However, as mentioned earlier, they don't update the Workforce project with the same frequency. The project is updated every minute. Additionally, if the mobile worker sets their status to On Break or Not Working, their location is not updated to the project at all until they return to Working. And if the mobile worker didn't set their status to On Break or Not Working before shutting down Workforce, the location the project has for them might be outdated and show them still working. Got it, you might think. But then you open Collector, and see that your location has better accuracy than you are seeing in Workforce! What is going on here? Well, it actually isn't too complicated: Collector doesn't always use the device's location services, bypassing it for the information coming straight from the location sensor (such as an external GPS). Location services are limited in the accuracy that they'll report, even if the device is getting a better accuracy from the location sensor. Because accuracy is critical in data collection, Collector uses the most accurate information available. Workforce, on the other hand, doesn't have the same requirements, so uses the most easily accessed information. Now you should understand how Workforce determines the location of mobile workers, what factors contribute to its accuracy, why it might vary between members of the same project, and why it might vary when using other apps. Now when you see worker location and it doesn't seem they are in the right place, yet the workers insist they are, you'll be able to figure out what it is you are actually seeing and how, if necessary to your project, to improve that information. Today we updated Workforce for ArcGIS on the Android platform. The 1.2.1 release addresses a number of key defects that were causing stability issues. The update is available now on Google Play and will be available soon on the Amazon App Store. Recycling, Graffiti and Tech services teams working for the City of Palmerston North New Zealand are getting a little help combatting Fly Tipping (Illegal Dumping) by using Workforce and Survey123. Read more about what they are doing here Location Based To Do Lists – Anything Mapping. The Workforce team is excited to announce that the Android version of the Workforce mobile app is now available within Google Play and the Amazon App Store. Workforce on your Android device integrates seamlessly with Navigator for ArcGIS, Collector for ArcGIS and Survey123 so that you can build end-to-end workflows on both the Android and iOS platforms. NOTE: If you are an existing beta tester of Workforce through the store, please note that we will disable beta testing on Friday Feb 17th. We recommend that you remove yourself as a beta tester now and download the released version. For more information about Workforce for ArcGIS, please visit our documentation site. We released a minor update to the Workforce for ArcGIS web app inside of ArcGIS Online today (Jan 31st, 2017). It includes a few focused enhancements that improve the way that you dispatch assignments to mobile workers. Here are a few highlights worth mentioning. Clustering can be an extremely useful method for visualizing work assignments, especially when viewed at a small scale. However you have asked us to provide the flexibility to turn off clustering so that dispatchers can see individual assignments even when multiple assignments are visible in a small area. To provide the utmost flexibility, this is a subtle switch available to all Dispatchers directly within the web app. You can now turn on/off clustering when you see fit. When creating assignments using the web app we have added some targeted enhancements that help improve productivity. Using the keyboard can be much faster than using the mouse and if you haven’t yet discovered, you can use tab and enter to move quickly through the experience of filling out the new assignment form. 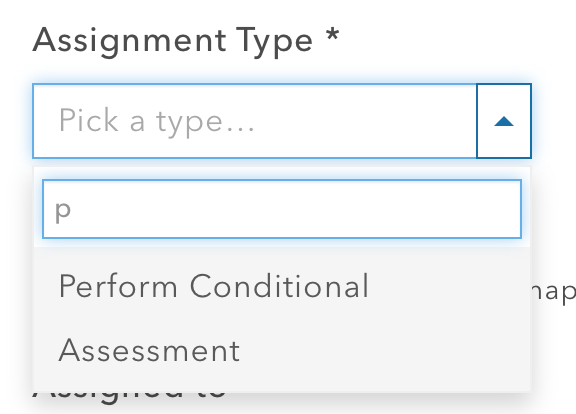 To help with this process, you can filter long assignment lists by typing characters that will get you to the type you want to set quickly. We added this same ability to the Priority drop down as well. Take that favorite selfie and making it your user thumbnail pays off in Workforce. It can be difficult to associate the worker on the map with the worker in the list but by adding the worker’s thumbnail image into the icon in both helps Dispatchers make that mental leap. When picking the Mobile Worker that you want to assign work to, it can be quite useful to see how far away they are from the assignment you want to give them. A subtle addition into the web app is a recognition of distance away. For a list of all additions to the web app, please read our What’s New. You might be wondering when Workforce will be supported with ArcGIS Enterprise 10.5? We are busy working on this right now. Coming either at the end of March or early in April we will provide a standalone setup that lets you install the Workforce web app on top of your 10.5 Portal install. Workforce projects, maps and services will be written to the ArcGIS Data Store. How about Android? Are you going to release it soon? Well yes we are! We are finalizing certification right now and look for an update coming soon to Google Play and the Amazon App Store! We have a lot planned for 2017! Please stay tuned for announcement of future updates as we move into the spring! Jordan Rogers, GIS technician at Utilities Kingston, saw the value that Workforce for ArcGIS could bring to their organization before the product was released in July 2016. “We created all 5,300 assignments in Workforce for ArcGIS and then categorized them based on the type of work that needed to be done. Within four months, we had already completed 3,100 assignments.” – Jordan Rogers. Gas meter inspections and replacements, previously completed using paper, have transformed into work assignments that are completed using Workforce for ArcGIS with Collector for ArcGIS directly updating their GIS so that asset status is more accurate and always up to date. We are pleased to announce the second beta release of Workforce for ArcGIS on the Windows 10 platform! You can download the Windows 10 beta directly from the Windows Store. If you haven’t already, join the Workforce beta program and test on either the Windows 10 platform or the Android platform. To learn more about Workforce for ArcGIS, please visit our documentation site! Today we released a new update to Workforce for ArcGIS on the iOS platform. This update adds support for Feature Search in the Worker web map, some Ux improvements to better support iOS10 and localization. Supported languages in this release in the following: Arabic, Chinese—Simplified and Traditional (Hong Kong and Taiwan), Czech, Danish, Dutch, English, Finnish, French, German, Greek, Hebrew, Italian, Japanese, Korean, Norwegian, Polish, Portuguese (Brazil and Portugal), Romanian, Russian, Spanish, Swedish, Thai, Turkish, and Vietnamese. For more details, see our recent blog post.